This week I learned a very important lesson. When it comes to the holidays always be prepared. I signed up for secret Santa at work and I completely forgot the first day. We were supposed to give something that jingles and it could only cost $1. I was so mad at myself that I forgot and I was trying to find a good time to run out for a few minutes. As the day wore on it became clear this was never going to happen. Then I remembered a bag of ornaments I’d left in the car. I was going to take them to donate and I hadn’t gotten around to it yet. 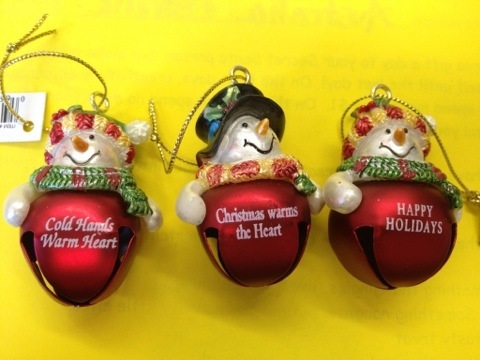 In the bag I found three little snowmen bells. Perfect! I had my something that jingles. My lesson is this always carry a bag of holiday cheer in your car in case of holiday emergencies. I know I will.